As a member of this community of people, yet as a person living outside of the neighborhood, I have struggled some with how I fit into the dreams of the community at large. I suspect these feelings are natural, and have been affirmed in my place as a member and in my feelings over the last few months. for me, the hardest part is the disconnect between what I feel called to be doing (loving neighbors in the College Heights community at large) and where my life is now (living in a small but comfortable apartment right next to campus, spending most of my time in/around school, preparing to graduate in May). With all that said, John, Rosten, and I have started on a new project that has already reenergized me and given me a focus on something I think could greatly benefit both the St. Ann Community and the College Heights neighborhood. The basic premise of aquaponics is combining aquaculture and hydroponics. Don’t worry if you’ve never heard of those before, I’ll walk you through it. 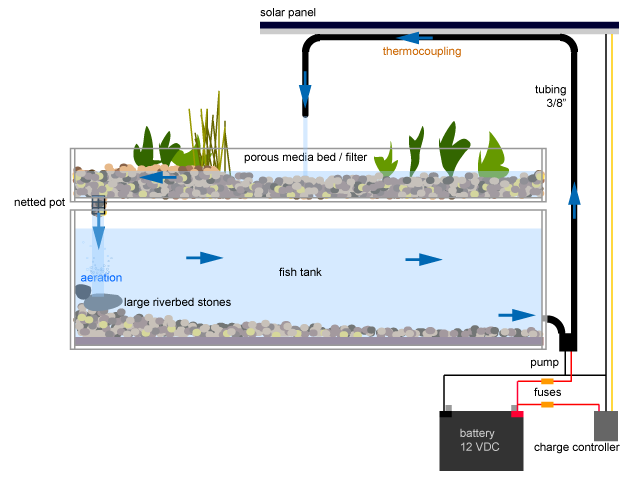 What an aquaponics system could look like. At its simplest, the fish (typically Tilapia) swim around in the water, producing waste. This waste gets pumped up into the grow beds, which are filled with rocks or other material for the plants to sit in. The plants’ roots filter the water, using the nutrients from the fish waste to grow much faster than plants left in regular soil. The now-filtered water is sent back into the fish tank, clean and ready for the fish to use again. All in all, this process grows plants and fish quickly and without harsh chemicals and pollutants. The result is yummy vegetables and fresh fish. Our plan as of now is to research aquaponics and build a trial system, with the hopes of maybe expanding, and later being able to teach those around us how to grow healthy food right in their backyard. It should also prove an interesting conversation point to get us talking with the neighbors. And in my mind, it’s hard to beat a good old community fish fry to get to know folks. From Friday night until Sunday afternoon, we will be going to Buffalo Gap for a community retreat! We will be talking about our life together thus far and who we are moving forward. Please pray for us as we have this time of discernment, growth, and sabbath.